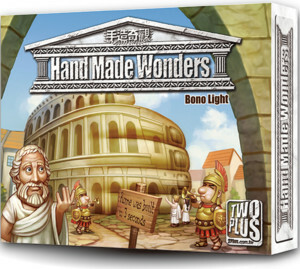 Hand Made Wonders is a party game that combines dexterity and co-operation. Everyone wears a colored bracelet on each wrist. After the judge gives a signal, players stretch out one arm, then players form teams with the other players who stretch out an arm with a bracelet in the same color. Depending on the size of the team, the players have to form an architectural wonder by following the instructions on a card, e.g., create the Great Wall of China with a horizontal row of five hands. All players on the fastest team get a reward card for either their left or right arm, depending on what they used. The first player to collect three left and three right cards wins.